1. Look left and move left foot into a WALKING STANCE toward L-1, execute a LEFT LOW BLOCK. 2. Step right foot toward L-1 into a right FRONT STANCE with a MIDDLE LEVEL RIGHT PUNCH. 3. 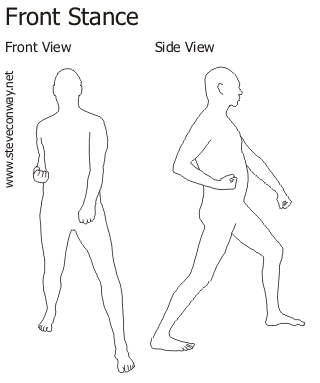 Look right and move right foot 180 degrees clockwise toward R-1 into a RIGHT WALKING STANCE with a RIGHT LOW BLOCK. 4. Step left foot toward R-1 into a LEFT FRONT STANCE with a MIDDLE LEVEL LEFT PUNCH. 5. Look left and move left foot 90 degrees toward -A- into a LEFT WALKING STANCE with a RIGHT OUTSIDE-IN MIDDLE BLOCK. 6. Step right foot to -A- into a RIGHT WALKING STANCE with a LEFT OUTSIDE-IN MIDDLE BLOCK. 7. Move left foot to L-2 into a LEFT WALKING STANCE with a LEFT LOW BLOCK. 8. Execute a right front snap kick to L-2, lower right foot into a FRONT STANCE with a RIGHT HIGH LEVEL PUNCH. 9. Look right and move right foot 180 degrees clockwise toward R-2 into a RIGHT WALKING STANCE with a RIGHT LOW BLOCK. 10. Execute a left front snap kick to R-2, lower left foot toward R-2 into a LEFT FRONT STANCE with a LEFT HIGH LEVEL PUNCH. 11. Look left and move left foot 90 degrees toward -A- into a LEFT WALKING STANCE with a LEFT HIGH BLOCK. 12. Step toward -A- into a RIGHT WALKING STANCE with a RIGHT HIGH BLOCK. 13. Pivot on right foot, move left foot 270 degrees toward R-3 into a LEFT WALKING STANCE with a RIGHT OUTSIDE-IN MIDDLE BLOCK. 14. Pivot 180 degrees counter-clockwise toward L -3 into a RIGHT WALKING STANCE with a LEFT OUTSIDE-IN MIDDLE BLOCK. 15. Look left and move left foot toward -B- into a LEFT WALKING STANCE with a LEFT LOW BLOCK. 16. 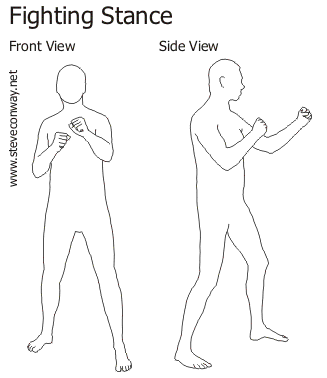 Execute a right front snap kick, lower foot into RIGHT WALKING STANCE with a RIGHT PUNCH toward -B-. 17. Execute a left front snap kick, lower foot into LEFT WALKING STANCE with a LEFT PUNCH toward -B-. 18. Execute a right front snap kick, lower foot into RIGHT WALKING STANCE with a RIGHT PUNCH toward -B-. YELL!! 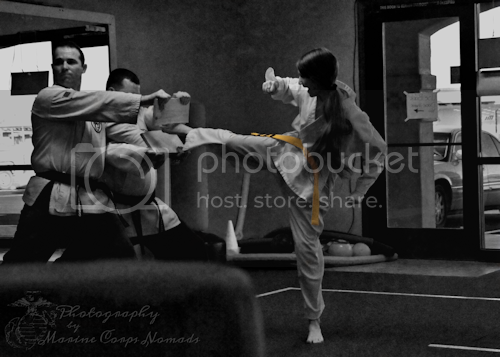 Similar to other martial arts, Taekwondo has a series of patterns or Poomsae. The literal translation of Poomsae is 'quality shapes of strength'. The Poomse are a set of 17 patterns mimicking combat scenarios with multiple attackers. Used as a way to train both the mind and the body, patterns act as a form of meditation as well as allowing the student to see the application of the various stances, hand techniques, blocks and kicks. When done properly, both the student and an observer should be able to imagine the opponent and techniques should be performed realistically with power and intent and in keeping with the meanings (below). The student should move with graceful fluidness and the sound of a snapping Dobok should be heard on any block, kick or strike. As the student progress, the Poomsae become more challenging and test other skills such as balance, timing and co-ordination. The general meaning of this form and associated trigram is Yang, which represents Heaven and Light. Also, this trigram has a relationship to South and Father. The first Taeguk form is the beginning of all Poomsaes, the "birth" of the martial artist into Taekwondo. This Poomsae should be performed with the greatness of Heaven.